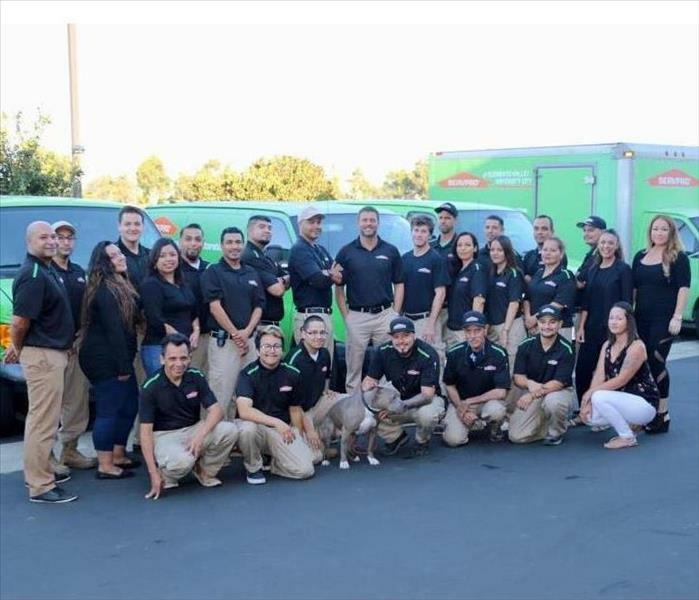 The amazing SERVPRO of Sorrento Valley / University City team. We value our staff not as just employees, but as members of our family. Our team is proud to be your first choice in all of your Restoration needs. Our crew will do all it takes to make your loss "Like it never even happened." Meet our excellent crew and office staff! At SERVPRO Sorrento Valley / UTC, we value our staff not as just employees, but as a whole family. That's how we can get the job done right the first time every time! Today is the day we take a moment to look at our Administrators and say "Thank you for all the hard work you do". Our Admins here at SERVPRO Sorrento Valley / UTC are very much appreciated for literally holding our hands and playing "mom" in the office. Thank you to our amazing Office Manager, Alicia, our Lead Auditor, Laura, our Collections Officer, Debbie, our half Admin / half Marketing Rep Jasmine, and our newest addition to the Admins family, Riley! These are the ladies behind the scenes, working with customers to satisfy their needs. We are ready to watch the Padres beat the Yankees!